ATP EXTREME is an advanced breakthrough in all-natural athletic performance enhancement providing incredible benefits without health risks for athletes in all sports! 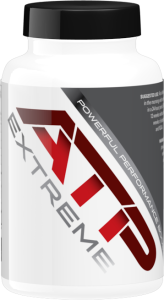 The key ingredient in ATP EXTREME is a patented form of ATP (Adenosine Triphosphate Disodium) that has been demonstrated to increase extracellular ATP levels in the body, resulting in improved athletic performance and recovery. In addition, our ATP supplement contains a synergistic blend of other powerful nutrients specifically formulated to help support the elevated needs of high intensity athletes without stimulants or side effects. Because of this, many athletes use this ATP supplement as their all natural pre workout. This is a serious supplement backed by serious science providing serious results! Once you try it, you will be sold! * Adenosine Triphosphate Disodium in the form of Peak ATP®. Peak ATP® is a registered trademark of TSI (USA) Inc and is protected by 5 United States Patents.